Why schedule a FEES for my patient? 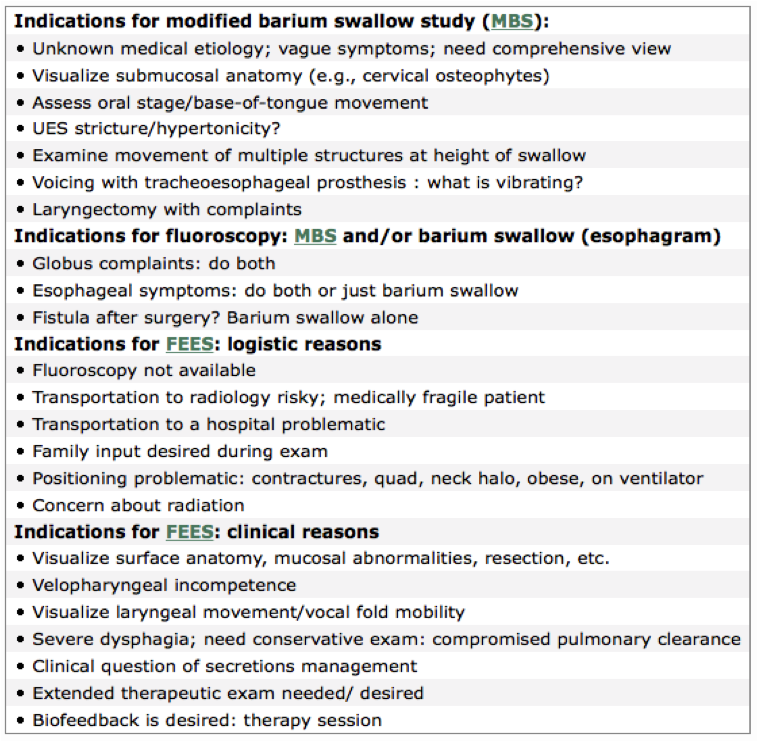 Should I schedule a FEES before or after my clinical swallow evaluation? When is this better to use FEES vs a video swallow? How long does the FEES procedure take? Do I need to be present during the FEES procedure? How do I get FEES started at my facility? I knew I didn’t want to continue to be “in the dark” when assessing and treating my patients with swallowing problems. But then I saw a light at the end of the endoscope! (Literally, there is a light there.) With my mobile FEES unit, I’m able to provide high quality images in real time to see exactly what is happening during the swallow, right at the patient’s bedside. Now I can assess specific foods (even pills), watch performance during full meals, and figure out which swallowing strategies work the best! Before I started doing FEES, I cringe to think how often I’ve kept patients on overly-restrictive diets just because I wanted to err on the side of caution. Or how often I’ve wondered if that sip of juice is silently sliding down my patient’s trachea? It’s such a peace of mind to know exactly what’s going on! If this sounds like you, and you haven’t already scheduled a FEES for your patient to see their swallow in action, schedule a FEES now, and together we can take a look! I may be holding the endoscope, but you, as your patient’s therapist, are the key to helping them manage their swallowing impairment. Let me help you help them, by giving you the information to make confident clinical decisions regarding their treatment. Without you, I’m nothing, but together, we can make a big difference! They are most often done following your initial clinical swallow evaluation, but doesn’t have to be! Sometimes you might want to have a FEES done before you do a full-blown swallowing evaluation: Maybe there’s a resident that has recurrent pneumonia, and you’ve been contacted to rule out silent aspiration. If the FEES exam shows no swallowing deficits, you may want to just do an evaluation only, and not plan any treatment visits. The FEES billing code (CPT 92612) can be used as the initial assessment/SOC date for a speech patient, and you may choose this to be an “evaluation only” encounter. When is it better to use FEES versus a video swallow? A basic FEES exam using only a few swallows of the traditional consistencies (thin liquid, applesauce, and cracker) will take approximately 20 minutes from setup to cleanup. The total time the endoscope is placed with a basic procedure is generally less than 5 minutes. If the patient is tolerating the procedure well, there are no time restrictions: you may be interested in assessing mealtime fatigue, “real” food textures (meats, breads, etc. ), or variations of the compensatory strategies. I’m happy to take the extra time and help you assess all the swallowing possibilities! Do I (the SLP) need to be present during the FEES procedure? No, certainly not. With the high-definition video and detailed report, you will have plenty of information to make confident clinical decisions for your patients. However, you know your patient the best, and there may be a specific food or strategies you’d like to try that you haven’t thought of until that moment. When you’re there first hand, you have the option to be in the “driver’s seat” and tell me what you’d like to do or try with the scope in place. There’s nothing like being there in person, but it’s certainly not necessary. If I take part in FEES can I document this as therapy time? Yes, you can! If you are participating in the exam, you can bill this time under the dysphagia treatment code (CPT 92526). Your participation in the FEES exam is highly valued. If you haven’t already, please read the above question Do I (the SLP) need to be present during the evaluation?